Earlier this week, we were offered a chance to interview Jagex Mod Chris L. about the recent Strykewyrms update. Like our past content update interview, all of the Forum Staff, D-Members and Chat Mods were involved in contributing questions in order to keep this interview a surprise, and we're now proud to present our Strykewyrm Interview! We had told the community last year that there wouldn’t be a 90+ Slayer monster update, but we didn’t say that we weren’t developing one for 2010. 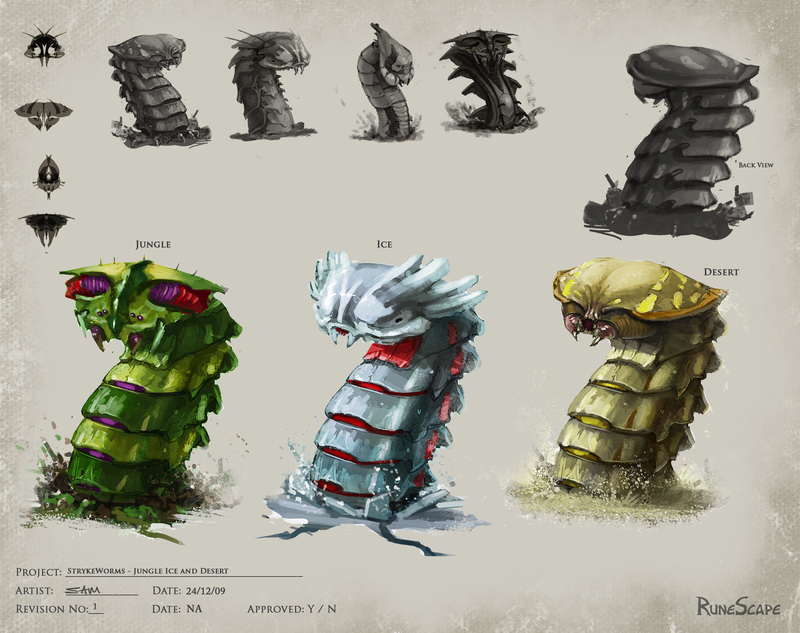 The aim was to provide some creatures of the same type to the higher end of the Slayer spectrum, to keep interest and variety for those leveling up the Slayer skill. I’m always in Slayer mode =D As the Slayer skill curator, it just so happened a few projects came down the line in the back-half of last year. After making the Within the Light quest for my elven curatorship, we wanted to then focus on a few areas of the Slayer skill to help relieve stress on those who were trying to train it. This started with the introduction of Kuradals dungeon and then a new monster to go shortly afterwards to introduce a bit of variety too. (as Kuradal’s focused on existing NPC’s) Even when I’m not actively on a Slayer project, I always like to think of small improvements that could be made to make peoples lives a little easier, such as auto-setup & reload on the dwarf cannon. I’m glad you like it, but I can’t really discuss future updates and plans, but linking any game content together is something many developers think about. It was done in this case for a variety of reasons. It might be a bit of both – last year saw many updates aimed at the higher-levelled players to ensure they still have something interesting to do, a new way of doing it, or a new area to train in – such as the Living Rock Caverns, Agility extension courses and Curses. I’ve already seen a Lava Strykewyrm request thread... but I have a feeling its just because people want an Ice cape! Even before the project began, I was thinking of what I might try if I could make a new NPC and was thinking of tunneling NPCs beneath the ground, which is where I got the Strykewyrm idea from later on. Back then, when it was just an idea, I even had a (maybe crazy) idea that all the wyrms would drop a common item (like a vial of liquid that gives off a foul stench). I was then thinking there would be an uber-strykewyrm (like a boss-sized mound) somewhere in the world of RuneScape and when a few people stood on the mound (all with the lure item on them), it would come out of the ground and eat them (Star wars meteor monster style!). Inside, it would be shaking about and you’d have to find and loot corpses for a chance of your “real loot” drop. Then you’d all go and attack the teeth and be spat back out somewhere else in the world! -Just an interesting way of collecting your loot after you’d finished a task. Haha, that wasn’t the only tie in we had. It was early on when we were in a GFX meeting one of the guys pointed out about the old helicopter game “Desert strike”.. I reminded him there was also a “Jungle strike” and we also found there was an icey-ish version “Solviet strike”. Aside from that, there were plenty of “omg its Tremors” comments during the project’s development. I can’t say about future updates, but a key point of the update was to bring back that balance in regards to what the black mask bought to melee based slayers. With the new items it was of course the perfect opportunity to combine them all together to save the dedicated Slayers a bit of bank space and gear-changing. In fairness, the other recent updates (such as Nomad’s requiring the minigame played) was a coincidence in the release schedule. There was a distinct tie to the feeling of Fire & Ice to the Ice strykewyrm, and trying to promote the higher-level/exclusiveness of fighting them, so it was more about the cape than the minigame, it just so happens that is the method of obtaining the cape. Whilst this may be frowned on by some players, it is something that is already deeply tied to the Slayer skill already – Quests. Many of the Slayer creatures are locked to Quest requirements, another part of the game which is essentially a pre-requisite. There was a lack of magic equipment with the Godwars update (excluding the steam battlestaff) and with Slayer already providing a Melee and Ranged weapon, it was great chance to help plug two “gaps”. As for the question of a ranged equivalent, I can’t really say at that time. For now Godwars provided the Armadyl armour set and Slayer the Darkbow. The first update was of course Kuradal’s dungeon – which was distinctly based around creating something that Slayers can only access on-task. The idea and mechanic was well receieved on the whole, so we decided to use a similar mechanic for these new creatures. This doesn’t mean all future Slayer creatures will follow this trend though. Basically, some of the specifications might be straightforward, some might be distinctly required or some might be flexible. For example with the Ice Strykewyrms, I felt that the next 90+ monster should be 95 to recognise the gap. It was originally asked to be level 92, but we compromised on 93 and already discussed that a higher slayer creature maybe considered this year too. From that, it is down the developer to work with what they’ve been given to think of the creature, where they might be located and how they might fight a player. After the concept brief is created, it gets submitted and we have a round of feedback on how well it satisfies the core aims of the project – sometimes parts of the core aims might even be changed to better fit a good idea. As for “what you’d most like to do in-game” usually, after I’ve received the core aims, I think from that approach – “given these core aims, what would I most like to do that is like that?” Then I get some ideas down on paper, and flesh out the best for submission. A huge "thank you" to Chris L. for taking the time to answer our interview questions! Additionally, the Jagex Graphics Team has given us a really cool piece of concept art showcasing the different types of Strykewyrms -- Check it out below!